Learn how to save time and money by taking the right lessons for you and understand what your driving examiner will want to see on your driving test. Very shortly you will be taking driving lessons in Oxford and be well on your way to passing your driving test, but which driving school should you choose? Depending on your skill level we have a range of driving lessons for you, Beginners, Part Trained, Confidence Building and Driving Test Rescue. We will always teach you what the driving examiner is looking for. Its ok you driving around and thinking you are doing fine because you haven't stalled the car or caused an accident, but how do you know if your driving is right? For you to have the best opportunity of passing first time you are going to need to know what is required of you, and this is why we are so successful and why our pass rates are very high. ...will teach you how to drive and each week you will have a lesson, where we differ is we show you how to progress quickly and we show you not only how to drive, but how to learn in an easy way. Unless you have a bottomless pit of cash, most learner drivers want to pass their driving test without needing to take too many lessons and you want to pass first time. What we will do is actually show you how you are assessed and you will know when you are ready to sit your driving test and pass it. The reason why people fail is due to a lack of preparation and because you know you are not 100% and are hoping the examiner doesn't ask you to do something you struggle with; it effects your confidence. 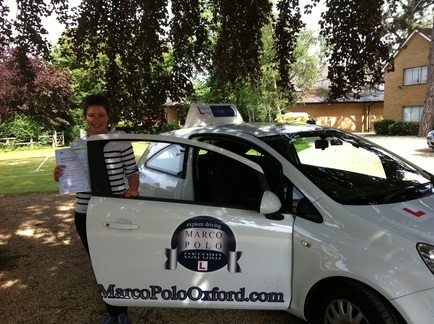 When you go for your driving test with Marco Polo Oxford Driving School ,you will know when you are ready, you will not need to be told and that will give you the confidence you need to pass your driving test in Oxford.